At last, the sew a long has come to an end. I have learned so much doing this sew a long. 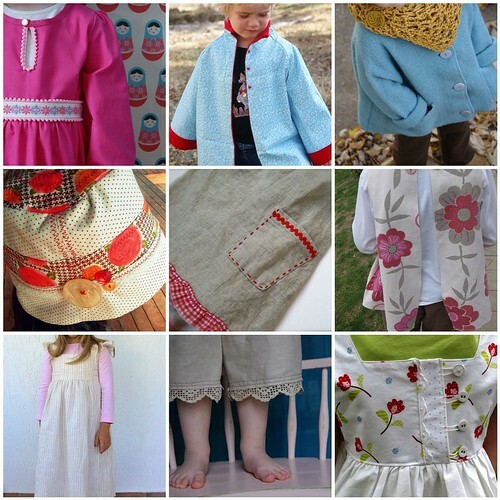 I have made new friends, expanded my sewing knowledge, and created lasting heirlooms for my daughter. It was fun and frustrating, but altogether an enjoyable learning experience. The best part of the whole project was "meeting" all of you who participated. Thank you so much for joining in. If it wasn't for you all I never would have stuck with this and I am so glad I did. There was only one person who finished this last project, Sarah, who finished not just one pair of pants but three! I bow to your amazingness Sarah! Now back to our regular postings of knitting, gardening and daily whatnot. Until then! Thankfully, I woke up this morning with only a stiff neck and a fraction of the headache I had yesterday. The important thing is that I feel better and not worse. A little Tylenol and some tea has patched me up for the day. February was insane. I don't know where to even start! We threw almost a thousand dollars into car repairs only to find out that it was a waste and we had to replace the car anyway. So we replaced the car. Everyone has been sick at least twice this month which means the house has been a disaster and I am sleep deprived. To add to the stress we have had a friend staying at our home for the last couple months while his son gets a bone marrow transplant at a nearby hospital. Tom and I are always happy to help out a friend, but having an extra person in the house does have its effects. Anytime I am feeling put out I just remind myself that if my daughter was getting a transplant in another state I would be so thankful to friends who gave me a place to stay and a break from everything that is going on. I am happy to help him. I am happy to report that even with minor complications his son is doing well and should be moved to outpatient soon. Needless to say, I haven't had much time for crafting of any kind. I have done lots and lots of comfort cooking for those living in my house. A couple favorite recipes have made it onto my food blog. I posted a wonderful and versatile recipe for Granola Bars as well as my all-time favorite Giant Chewy Chocolate Chip Cookies. The only crafty projects I finished in February were a prize for the Carefree Sew Along, finally on its way to the winner, and my Sea Clover Socks which I can't believe I actually finished. I worked on them a few rows at a time, at night, mostly to relieve stress and get me to sleep. Knitting works great for that. So, I know you are all wondering about the sew a long. My pants are in the works but not finished. You can't be too surprised! Has anyone else has finished? I really want to see if someone did the jacket. I love that pattern, but knew I wouldn't be able to finish it. So far one person has turned in their link. Post your link on this post by March 5th. I'll be back later this week with some knitting pics.